Summertime is my favorite time for engagement sessions! 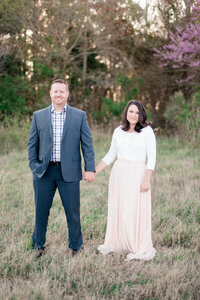 We met up with Sean and Christy near their wedding venue Two Rivers Country Club. Christy is quite familiar with this beautiful area and she happily showed us around some of the prettiest spots during their session. I especially loved ending on the small beach in the water! Thank you Sean for getting your feet wet! Those pictures were definitely worth it! I love talking with our couples about their big day during the session. It helps us get to know more about their style and vision for their wedding. Sean and Christy’s black tie affair will be this August on the beautiful grounds of Two Rivers Country Club! Talk about a classy event! Christy has such an amazing vision for her day and we don’t doubt that these two are going to make a stunning couple! Sean and Christy really listened when we suggested evening photos. We lucked out with clear skies and gorgeous golden light. I love the challenge of shooting in different lighting scenarios but nothing beats the golden glow of evening sun! During the engagement session the summer sun shone through and although it was a little hot, these two handled it like champs! I feel like lately we have been getting rainy overcast days so it was refreshing to to get that golden glow! Luke and I cannot wait to celebrate with these two! They have an incredible team of vendors and we know that this is going to be an epic celebration! Thank you Sean and Christy for hanging out with us! We cannot wait to capture your gorgeous summer wedding here in a few short months! And because it was Memorial Day weekend I had to grab one of these! More Summer Engagement Sessions Below!